Cancer immunotherapy is all the rage right now in health and science, not only for the potential it offers to treat multiple types of cancer, but also for the promise it holds for major profits by drug companies. The global market for cancer immunotherapy is predicted to approach $9 billion in 2022, with 85% of the market share predicted to be from immune checkpoint inhibitors. Consequently, many biotech and pharmaceutical companies are joining the race to develop the next game-changing immunotherapy for cancer. Cancer immunotherapy was the topic of February’s BioScience Forum, which featured Dr. Gary Starling, the associate vice president of biologics discovery operations at Merck Research Laboratories in Palo Alto. In his talk, Dr. Starling discussed how Merck is manipulating the human immune response to cancer with biologics, and that the company’s main focus is on clinical advances of biologics in its immuno-oncology program, specifically the immune checkpoint inhibitor Keytruda (pembrolizumab). 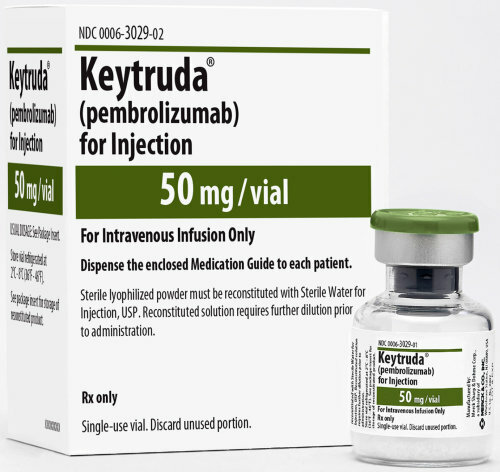 Keytruda is a monoclonal anti-PD-1 receptor inhibitor that boosts the immune response to cancer by inhibiting the PD-1 checkpoint pathway. Checkpoint receptors like PD-1 are expressed on the surface of T-cells, which are important immune cells that can recognize and kill cancer cells. Checkpoints act as immunological brakes that prevent overactivation of the immune system and destruction of healthy cells. Cancer cells can hijack checkpoint pathways and turn off the T-cell response thus evading detection by the immune system. Though Keytruda received accelerated approval by the FDA in 2014 for the treatment of patients with metastatic melanoma (who were positive for the BRAF V600 mutation and were previously treated with ipilimumab), Keytruda’s success does not lie solely with melanoma. The drug is currently being tested in over 60 clinical trials for multiple indications including non-small cell lung (NSCLC) cancer, renal cell cancer, triple negative breast cancer, and classical Hodgkin’s lymphoma. Keytruda specifically inhibits the PD-1 receptor on T-cells. Cancers that have evolved to produce the PD-1 ligand can shut down the T-cell response to cancer, but are unable to do so in the presence of Keytruda. Dr. Starling highlighted that Keytruda is extremely effective in reducing tumor size and that many patients experience a rapid and durable response without the development of drug resistance. Patients who were non-responsive to other standard care cancer therapies are now living years beyond what was expected after starting Keytruda. Keytruda is also being tested in a number of combination studies to treat advanced melanoma (Amgen’s T-Vec), advanced NSCLC (Incyte’s IDO inhibitor, INCB24360), advanced renal cell carcinoma (Pfizer’s Axitinib and GlaxoSmithKline’s Pazopanib), prostate cancer (Adavaxis’s ADXS-PSA), HER2 positive breast cancer (Roche’s Herceptin), and other solid tumors. Dr. Starling and his group’s immediate goals: Identifying new therapeutic targets and effective combinations therapies to treat cancer. GITR is a costimulatory immune checkpoint receptor protein whose expression is upregulated in activated T-cells. Merck has developed an anti-GITR agonist antibody, MK-4166, to increase T-cell and immune response to cancer. So far, anti-GITR antibodies have shown efficacy in reducing tumor size in mouse tumor models both as a monotherapy and in combination with anti-PD-1 antibodies. Following these exciting results, MK-4166 has now entered into Phase 1 clinical trials in human patients with advanced cancer malignancies. Current challenges include: Identifying determinants of responsiveness vs. non-responsiveness in patients, finding out how to select for patients that will respond well to Keytruda, and how to elevate immune T-cell responsiveness to cancer cells. He also stressed the importance of tailoring immunotherapy and combination therapies to determine which mechanism of treatment is best for each tumor type. It was clear from Dr. Starling’s talk that cancer immunotherapy and checkpoint inhibitors specifically are pushing the boundaries of standard cancer treatment. An important question that needs to be addressed in the future is how to further improve the patient survival curve across a number of different types of cancer. Keytruda, along with a number of other checkpoint inhibitors, gives us the hope that one day, cancer will be a treatable disease rather than a death sentence.